In this scrapbook, Marion documented her experiences as a student as part of the Simmons College School of Household Economics, Class of 1928. Marion was very active in student life at Simmons, and so her scrapbook is a snapshot of not just Simmons and Boston in the mid-1920s, but also of a lively, dedicated, and theatre-loving woman. Marion’s scrapbook is a document rooted in her life in the 1920s, and we aim to present it faithfully to its original form. The content, images, and opinions presented herein are those of Marion and her contemporaries and are not endorsed by Simmons or the Notable Women of Simmons project. This scrapbook was generously donated to Simmons by Marion’s family and was digitized as part of the Notable Women of Simmons project. 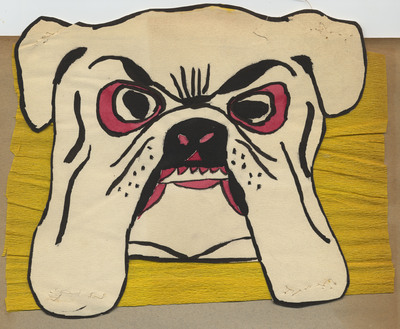 Colored, paper mask of a bulldog's face with an attached yellow tissue paper.